Shoreline Area News: City of Shoreline wants to know what you find useful about "Currents"
City of Shoreline wants to know what you find useful about "Currents"
Ten times a year, the City of Shoreline sends Currents, the City’s newsletter, to approximately 24,000 households and businesses in Shoreline. In the 2018 Resident Satisfaction Survey, 87% of residents said they received information about City issues, services, and events through Currents. 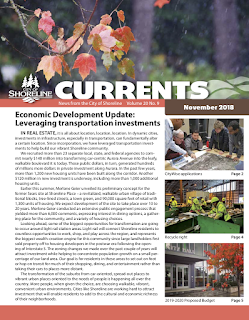 According to the City, "Because residents play such a big role in making Currents so successful, we want to make sure we are providing you with information that is the most useful and valuable it can be, in a way that works best for most people." The City would like residents to fill out a short survey on what they find most useful about Currents and provide ideas on how you think it could be improved. Save money. Send it electronically.